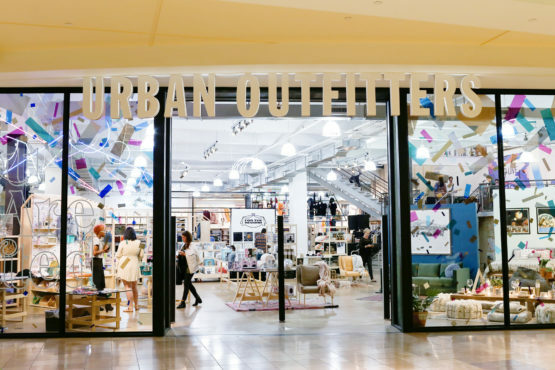 URBN Brands at King of Prussia Mall - Blue Rock Construction, Inc.
Blue Rock remodeled and constructed new retail spaces for URBN brands Anthropologie, Free People, Urban Outfitters and Pizzeria Vetri in the Pavilion at the King of Prussia Mall, just outside Philadelphia, PA.
All projects started in June 2016 and finished together for a Grand Opening in October, just a five-month construction turnaround. Along with work on the four brands, Blue Rock constructed a shared-services, back-of-house space on the third floor that includes 7,540 square feet of offices, visual merchandise rooms, conference rooms, stockrooms and employee breakroom. 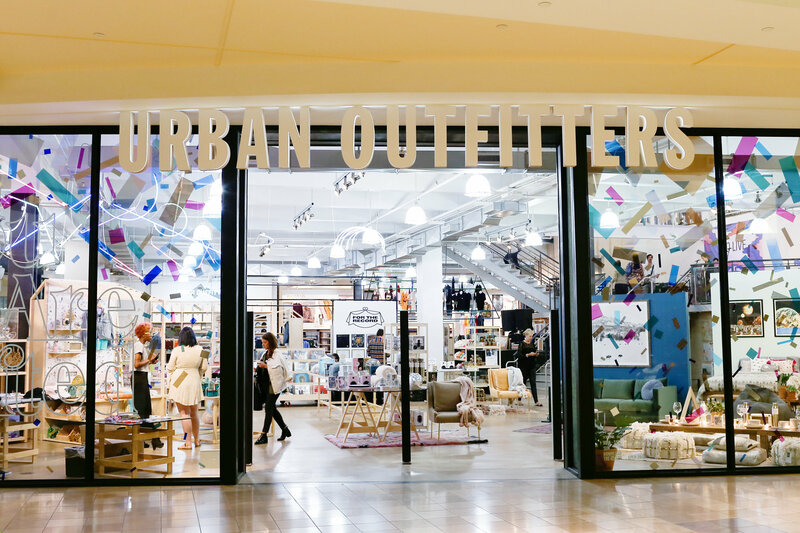 For Urban Outfitters, Blue Rock delivered a complete renovation of the first and second floors while keeping the store open to the public. 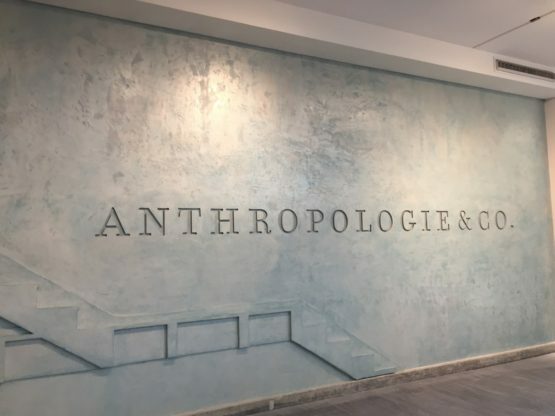 At 19,800 square feet, Anthropologie is nearly three times the size of its average store. The new store features reclaimed wood flooring, plus a custom plaster finish at the storefront and throughout the sales area. Moving from its original mall location, the 8,200-square-foot Free People is its largest to date. The storefront features custom hand-carved beams imported from India. There’s also reclaimed wood flooring and custom plaster finishes throughout the store. Exterior windows and new skylights were added to flood the store with natural light. Pizzeria Vetri is located next door to the Urban Outfitters on the second floor. Blue Rock delivered an 8,780-square-foot concourse common area centrally located on the second floor that includes a seating area for Pizzeria Vetri, and a sit-down bar equipped with three TVs. Blue Rock also added structural steel and new concrete floor slab to close the existing mall opening between the first and second floors. The concourse work includes renovations of changing mall finishes to match URBN’s aesthetics. 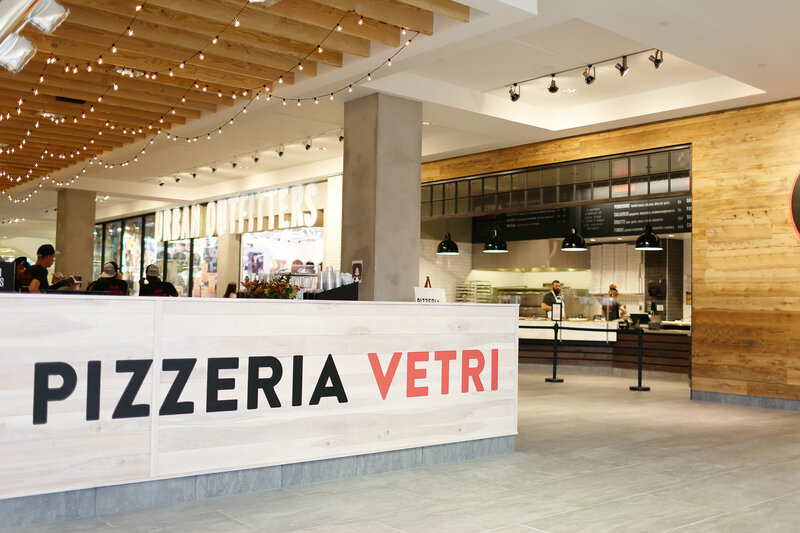 The project marked the first time all three clothing brands, plus a Pizzeria Vetri restaurant, were constructed in the same space. – Ken Masri, Development, Urban Outfitters, Inc.